LESS than 8 months into the business, Joel Tan was already expanding his first fitness studio from 1,700 sqft. to 2800. Needless to say, he was excited but overwhelmed at the same time. 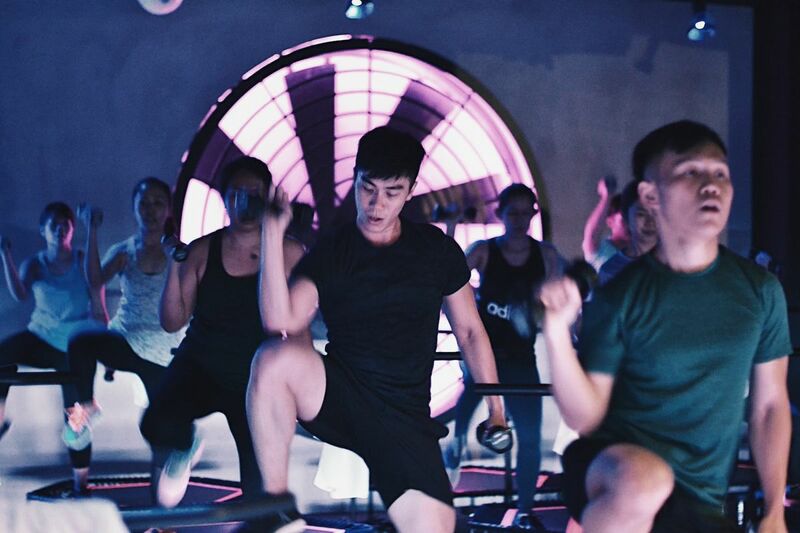 BBounce Studio, Singapore’s first dedicated rebounding fitness studio, was founded in 2016 by two former national swimmers, Tan and Leslie Kwok. It was an unusual and relatively new concept in fitness, and naturally, it was hard to imagine being whipped into shape from bouncing alone (or, to use the proper industry term, rebounding). However, the new exercise caught on rapidly, drawing both men and women from 20s to the 60s. It seems like the risk in leaving the safety of his full-time job at Ernst & Young may have paid off. Now entering its third year, Tan has expanded BBounce, yet again, with a new studio, which is twice the size of the first studio, BEATX. With a much bigger studio, the duo incorporated additional fitness classes and explore new concepts in training. We speak to Tan to find out what can you get out of attempting these exercises. What’s the advantage of doing “vertical”, or more specifically trampoline exercises? Vertical exercises are extremely effective in cleansing or detoxing the body’s lymphatic system. Your body is vertical, hence exercises which involves vertical movement tends to be more effective in having stronger cells in the body. Swimming is another good example of vertical and horizontal workout. Trampoline exercises or rebounding is more than just fun or play. it actually strengthens your lower body, reduce the risk of injury or shock and most importantly, it’s good for your lymphatic system. Can you build muscles from rebounding or it’s just improving cardio? Two of our most popular classes (Lite & Hybrid Rebounding which is trademarked), have different results or outcomes. Our Lite class is a 50 min cure cardio workout, aimed at improving overall fitness and endurance capability while our trademark Hybrid Rebounding class is a full body workout session that promises changes to the body including muscle sculpting, systemic cardio and muscle endurance. Rebounding is good for toning and slimming. However, to build muscle, Hybrid Rebounding is more effective when we combine different workouts into one, making use of weights to push you harder. How intense can you get with trampoline exercises? Rebounding can get pretty intense and you can expect your heart rate to increase up to maximum beat. Because the classes at BBounce Studio and BEATX Studio are specially designed to mimic how athletes train, hence you can expect the intensity to be quite high. Assuming if there are no changes to a person’s diet, how soon can he see results after attending your classes? You can expect to see results in 8 weeks if they do it on a regular basis, recommended 4 times a week. How did you get started with BBounce? I used to swim for the national team and have been an athlete for so many years, naturally, I wanted to do something related to wellness. There aren’t many boutique fitness studios in Singapore offering professional classes specially designed for the everyday masses yet, keeping the elements of a good tough workout. Hence, after I left my full-time job with Ernst & Young, I decided to take a risk and start BBounce. We have since grown and expanded and I will definitely continue to introduce and reinvent the workout scene in Singapore. Lance is the digital editor who takes care of the Singapore and KL editions. When he's not shuttling between the two cities, he's on the lookout for the next big fashion and lifestyle trends.